It’s a Leaf Expansion Revolution! Last month we shared with you the necessity for some patients to receive treatment with palatal expansion for proper spatial development of the palate and in some instances to allow for successful orthodontic treatment. The importance of expansion to correct for maxillary constriction or crossbite is not only important to allow ample spacing for incoming teeth, studies find that this constriction can also be a factor in airway restriction in children resulting in decreased nasal airways and impaired respiratory function. Further studies show that treatment of palatal developmental problems become more complex with age. Therefore, younger patients are more responsive to early orthodontic intervention with expansion as less pressure is required to achieve the desired result. However, in the past, orthodontic treatment with a palatal expander relied heavily upon the patient and at a great cost. 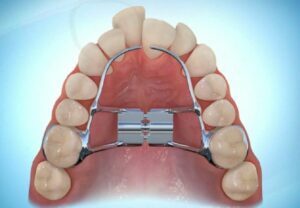 A Rapid Palatal Expander (RPE) is a device bonded into place using the patient’s teeth as anchors. It can markedly increase the width of the upper jaw allowing upper and lower teeth to fit together. For some patients, this additional room may prevent the need for extraction as more space is created for the permanent teeth to come in. 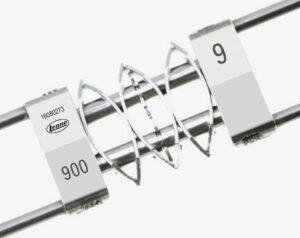 The device is connected by a screw in the middle which joins the two sides. Over time, and at doctor prescribed intervals, the patient or their parent uses a “key” to turn the screw - expanding the palate and therefore creating the necessary space for proper dentition. As the jaw expands, new bone fills in between the two halves of the palate in a process called distraction osteogenesis. RPE treatment often requires several appointments and expansion can take anywhere from a few weeks to several months. Treatment includes impressions, followed by the seating of the appliance and follow up visits for progress checks. Compound that schedule with extra visits due to the inability of patients or parents to perform proper home treatment… then patients can expect more visits. Indeed, that can be a challenge to treatment! However, Dr. Razdolsky has discovered a great treatment alternative for Forever Smiles patients in the self-activating, leaf-spring expander. The Leaf Self Expander is a product of Leone Orthodontics of Florence, Italy, a company with which Dr. Razdolsky has held a close professional relationship with the head engineer Gabrielle Scommegna since the late ’90s. 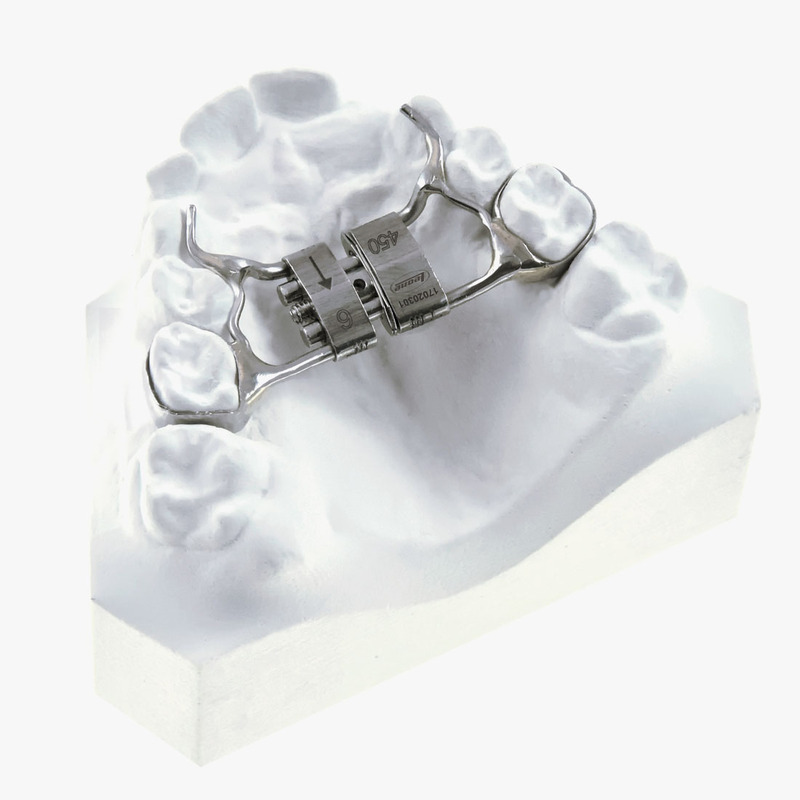 The design of the Leaf Self Expander is similar to that of a conventional rapid palatal expander, but instead of a midline jackscrew it uses double nickel titanium leaf-shaped springs (see Fig. 1). When placed, the springs are compressed with an applied force so that as the spring recovers or returns to its original curve-like shape during deactivation which results in a strategically calibrated expansion of the upper arch (see Fig. 2-5). What’s better is that according to the manufacturer, the Leaf Self Expander requires no effort on behalf of the patient and perhaps only minor clinical observation throughout treatment to confirm results are on track! Pre-loaded to the patient’s unique needs each spring’s super-elastic and flexible properties release predetermined, controlled, and continuous forces throughout treatment as they decompress. Therefore, expansion therapy with this self-activated device relies solely on a pre-defined course of treatment. Make Room for Forever Smiles! orthopedic abnormalities. Sounds pretty complicated, and it is! But dentofacial abnormalities are not always so easy to spot and, in some instances, patients and their families do not even see or recognize there is a problem. While there are many orthodontic appliances available to correct problems like crooked or misaligned teeth, sometimes these appliances need a more solid foundation in order to be truly effective. The palatal area at the roof of the mouth, for example, must be also be considered. The palate, jaw and the available space required to properly align teeth is often an issue which must be addressed long before a patient can even have braces. This is why Dr. Razdolsky and the Forever Smiles team advocate early diagnosis and treatment because, in the case of dentofacial orthopedics, pre-adolescent treatment is more often the least invasive and offers the greatest opportunity for successful orthodontic treatment when the time comes. We have shared with you the negative consequences of a small upper palate; however, growing evidence suggests that maxillary constriction left untreated can also be a factor in airway restriction starting in childhood and continuing through adulthood. It is even suggested that the effects of a maxillary or palatal expansion through treatment with a rapid palatal expander (RPE) can help increase nasal airway and improve overall respiratory function including air intake, better sleep, and even long-term health. In its earliest development, the palatal area at the roof of the mouth of a pre-adolescent is still adaptable with hardening into bone only beginning and continuing throughout the teens. Therefore, the roof palate of younger patients is much more responsive to the orthopedic treatment with an appliance and less pressure is needed to achieve the desired result. When less pressure is used, we reduce the risk of negative consequences. For example, use of an expander while a patient still has some baby, or primary teeth along with permanent teeth, allows the use of the baby teeth to serve as anchors for the expansion appliance. You see, expansion appliances use the strength of the roots and surrounding bone of the teeth to which they are attached. It is those teeth and supporting bone that carries the lateral pressure of the expansion as the palate opens. When baby teeth are used to support the expander, the newly-erupting adult teeth do not bear any of the expansion pressure and instead receive benefit from the additional space. In most cases, the reason for expansion is because of a crowded upper roof palate resulting in crooked or protruding teeth, jaw misalignment or crossbite. New and permanent teeth that come into the mouth with adequate bone and soft tissue support benefit from the ideal scenario for long-term stability and more sound periodontal health. For patients with a crowded, developing mouth, the plan is to create space for the teeth to come in straight without the risk of future gum-related issues or tooth damage. In treated patients, an expansion appliance is placed into the roof of the mouth as high as possible without negatively affecting palatal tissues. As a result, patients sometimes experience temporary difficulties with speech and swallowing, similar to that caused by a retainer. This inconvenience usually passes quickly as patients grow accustomed to the device. The result of all this collaborative effort said Dr. Razdolsky, is a more successful treatment and better long-term results for a lifetime of beautiful Forever Smiles. Dr. Razdolsky and the Forever Smiles team are honored and proud to be celebrating their 30th anniversary at the Buffalo Grove location. That’s 360 months and more than ten thousand days creating beautiful Forever Smiles for patients both past and present. “Working with patients of all ages over the past 30 years has been an amazing experience,” said Dr. Razdolsky. “Through the years, we have not only gotten to know our patients, they have become a part of our own family. We’ve been able to help hundreds of children achieve beautiful Forever smiles, and then subsequently their own children come to us as well,” he continued. Plenty has changed at Forever Smiles over the past thirty years, including hairstyles, clothing fads, interior finishes, furnishings, and even the technology. But what the team at Forever Smiles is most proud of is their on-going commitment to stay up to date with the latest in Orthodontic advancements. Indeed, there have been big changes in technology which has vastly improved the field of orthodontics. Dr. Razdolsky regularly shares with us how orthodontics is continually evolving, and how he propels his practice to keep pace. For instance, Forever Smiles recently joined the National Dental Practice-Based Research Network. This is a great organization which Dr. Razdolsky thinks will be pivotal to research and new opportunities for treatment in the field. It also provides Forever Smiles a tremendous platform to share ideas with other talented dental professionals which in-turn benefits patients with better diagnosis and treatment outcomes. Yes, the office has experienced cosmetic and technological changes over the past 30 years, but what has not changed? The Forever Smiles commitment to providing patients the best level of care in a professional and inviting environment. During their years at the Buffalo Grove location, Dr. and Anna Razdolsky have raised their four wonderful children and recently celebrated the birth of their second grandchild. And while reminiscing about the past is great, what the future holds is very exciting. The Forever Smiles team looks forward to building strong relationships with our current and future patients while creating Forever Smiles that will last a lifetime! Sleep disorders, including sleep apnea, have become a significant health issue in the United States with an estimated 22 million Americans suffering from sleep apnea. Nearly 80 percent of those cases are diagnosed with moderate to severe obstructive sleep apnea (OSA) caused by a blockage of the airway. It is found that orthodontists are uniquely suited to treat sleep apnea, as the same examination for orthodontic therapy can be used to screen for potential sleep apnea patients. Moreover, the oral devices for managing OSA are often repurposed orthodontic appliances. Therefore, further study of how orthodontic therapy for children and adolescents can, for many patients, help cure sleep apnea is of pressing importance. This years’ American Association of Orthodontics (AAO) 2019 Winter Conference was a leadership forum for this increasingly important topic. Titled, Sleep Apnea and Orthodontics: Consensus and Guidance, the conference held January 25-27, in Marco Island, Florida included more than 20 lectures covering a wide range of perspectives. Discussion and lectures offered an intensive examination of obstructive sleep apnea presented by dental and noted medical specialists and experts in the field. In fact, the relevant ties of sleep apnea to the field of orthodontics is so significant the AAO has established a task force for consensus review. Attendees at the conference were the first to get an early look at the committee’s report and were able to engage in in-depth discussions to further share first-hand experiences with other professional peers. Dr. Razdolsky went on to say, “We have seen a significant number of patients who exhibit early indicators that can point to OSA later in life. As studies and research on the issue become more prevalent, we can learn to not only help reduce the number of those afflicted, we can also use orthodontics to address issues in adults using the same techniques. Just another added benefit to more adults having braces,” he added. Thankfully the conference wasn’t all lectures halls. Dr. Razdolsky did make time to enjoy some of the activities available around Marco Island.